This isn’t the only kind of “pie” that Crockett Johnson was interested in. 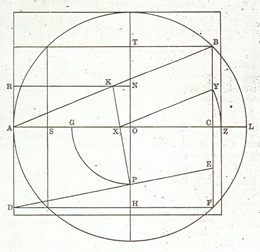 In addition to “all nine kinds of pie that Harold likes best,” Johnson also drew inspiration from π (3.14159265…) — the ratio of a circle’s circumference to its diameter. In early 1968, he began the project of “squaring the circle,” constructing a square with the same area as a circle — but using only a straight-edge and a compass to do so. This is impossible, but he was either unaware of this fact or undeterred by it. 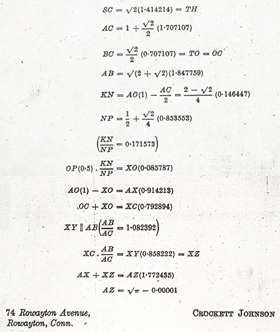 Not a trained mathematician, Johnson worked his way towards the answer visually. He painted solutions, testing different theories on his canvas (which was actually mortarboard — canvas intimidated him). He painted two versions of this. 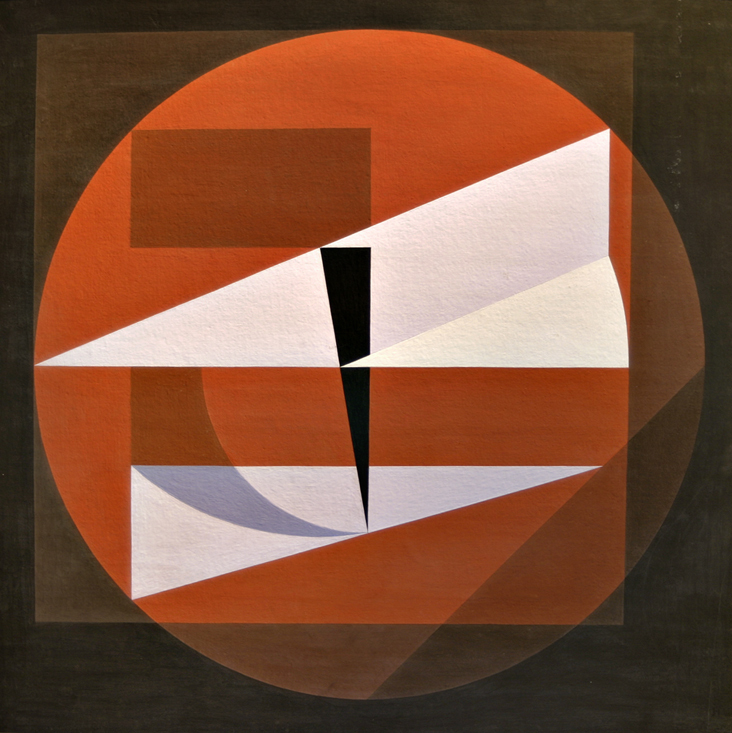 The other can be found at the Smithsonian’s on-line exhibit, Mathematical Paintings of Crockett Johnson. I recommend you visit its site for a more complete explanation of the mathematics behind the painting. Johnson would publish his second original contribution to the field of mathematics in 1975, just prior to his death. Philip Nel’s The Purple Crayon and a Hole to Dig: The Lives of Crockett Johnson and Ruth Krauss — my biography, forthcoming from the University Press of Mississippi in April 2012. 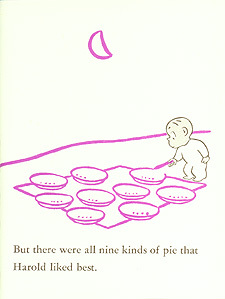 LaVern Christianson’s π Day songs. Color Sunday Barnaby: March comes in like…. A color strip from March 1947. Crockett Johnson’s gonzo Bosco ad, c. 1960. Merry Christmas from Mr. O’Malley. A color Sunday Barnaby from December 1946. Crockett Johnson vs. Hitler. A six-panel cartoon from February 1942. Barnaby. In Color. A Sunday Barnaby from July 1947. The Debut of Crockett Johnson’s Barnaby. Ads in PM heralding the strip’s debut. Crockett Johnson: Ford’s Out Front. Ads for Ford, featuring the Little Man with the Eyes. He Was a Teen-Age Harold: Crockett Johnson’s High School Cartoons. When I was in the USSR in 1980 I sent my nephew Stephen a postcard that consisted solely of Pi backwards, 562951413, (no decimal), figuring it would amuse him and give every spook agency from Moscow to Virginia something to do for a few hours.